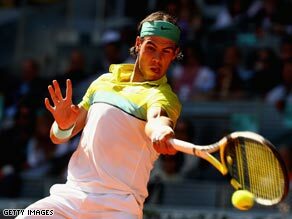 (CNN) -- Clay-court king Rafael Nadal saved three match points before defeating third seed Novak Djokovic 3-6 7-6 7-6 in an epic four-hour struggle to reach the Madrid Open final on Saturday. Nadal won a mammonth tie-break to eventually defeat Djokovic to reach the Madrid final. World number one Nadal claimed his 33rd successive claycourt win following a monster tie-break that he eventually claimed 11-9. The Spaniard finally progressed on his second match point to claim his third win over the Serb in a month -- after victories in both the Monte Carlo and Rome Masters finals. Both players were clearly exhausted at the end of their marathon showdown and embraced at the net at the end of the match. Nadal will play a familiar foe in Sunday's final as as world number two Roger Federer kept alive his hopes of a first title this year by beating fifth seed Juan Martin Del Potro of Argentina 6-3 6-4. "In a game like that with so many match points I think you need luck to win, there's no doubt about it, but I played with great courage and I think everything went well for me," Nadal told reporters afterwards. "I played the first set poorly, and it looked very bleak for me. But I think that little by little I was able to get my rhythm and ended up playing well." The victory means Nadal, judged by many to be the best clay-court player ever, has now won 150 of 154 matches on the surface since 2005 and recorded 33 consecutive victories stretching back over a year. Meanwhile, top seed Dinara Safina will bid to win back-to-back titles when she faces Danish teenager Caroline Wozniacki in the women's final on Sunday. World number one Safina will be playing her third clay final in as many weeks after losing in Stuttgart to Svetlana Kuznetsova before beating her Russian compatriot last weekend in Rome. Safina cruised past Swiss Patty Schnyder 6-4 6-2 in Saturday's semifinal while Wozniacki ended the run of French veteran Amelie Mauresmo 7-6 6-3.